Winter in the Pacific Northwest is notoriously grey. I’m pretty sure the weather this time of year is the reason for our soggy reputation. It would be awfully handy to be able to manifest sunshine whenever the dreary clouds become overwhelming. I can’t give the sun to those I love but I have found a way to share a tiny taste of it this Christmas. In many parts of the country it was not so long ago that finding an orange in the toe of a Christmas Stocking was a treasure to be savored. Now Navel Oranges, lemons and limes are as omnipresent in the grocery store as peanut butter and corn flakes. Thanks to refrigerated cargo containers and neighborhood super markets, fresh citrus is abundant during the long dark winter months. I have gotten used to the seasonal ebb and flow of Washington’s produce but it is easy to take the presence of citrus for granted. In August we went on a grand road trip from our home north of Seattle to the Bay Area and back again. Among our stops was a visit with my aunt in Santa Clara, CA. During our stay I noticed a cute little tree growing what looked like large round limes. When I asked her about the funny limes I learned the fruits were oranges but they were far from ripe. My aunt along with many lucky warm climate residents has the joy of homegrown fresh picked oranges in December and January. The thought of stepping out the back door and plucking an orange from a tree in winter blew my mind. Before the gloom overwhelms us I plan to share a bit of sunshine with my family and friends. 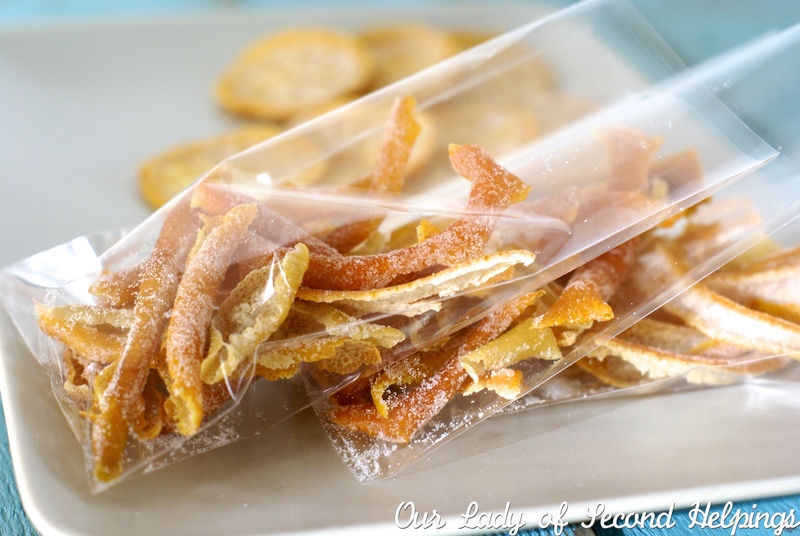 The chewy strips are sun kissed sweet and sour treats. They can be nibbled right out of the jar. I like them chopped up and sprinkled on cereal, folded into quick bread batter, or atop cupcakes. Not quite the usual Christmas confections but a vibrant reminder that there is brightness hiding behind those clouds. To make enough candied citrus for giving, I bought an 8 pound bag of Navel Oranges. I didn’t think I would make it through the entire bag but once I got a rhythm established it was an almost meditative process. Once the oranges were striped I went after a quartet of lemons and a pink grapefruit. Then I ran out of citrus – probably a good thing. The tricky part turned out to be drying the peels after they came out of the simple syrup. While I was peeling and meditating I didn’t consider how I would lay out all the bits of citrus. I sorted them out on the counter and covered them to dry overnight. The following morning everything looked exactly as I left it hours before. The peels were sticky, limp, and cold. Our afore mentioned damp climate and cool overnight temperature did not wick away a single drop of moisture. Plan B needed to be implemented. The peels went into the oven on a very low temperature. After a few shifts the damp evaporated and the edges curled attractively. After a few days in mason jars with a bit more sugar they had finally cured and were all set to be packaged up and gifted. 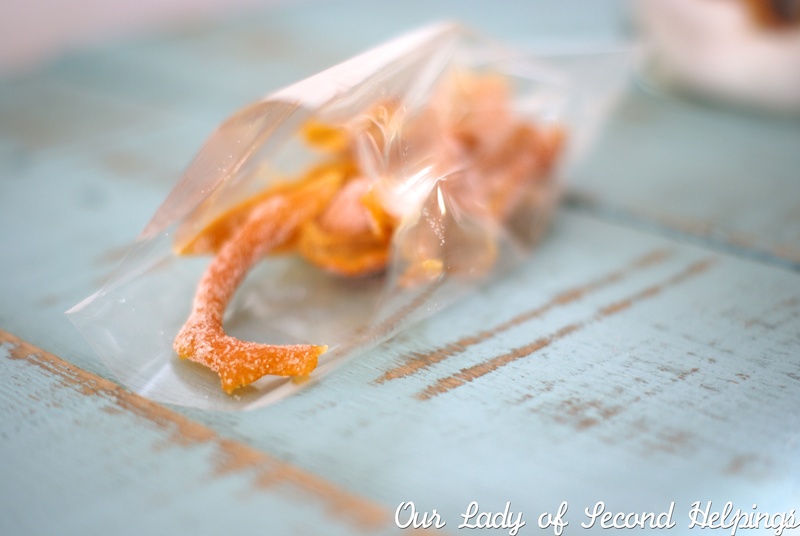 A word about the slices: These candied orange slices were the result of an experiment. I used an orange whose zest was removed and had been sitting, unwrapped, in the refrigerator for two days. The rind had dried and become crusty making it easy to cut the orange into extremely thin slices. I did not blanch the slices as I did with the peels. After a generous 10 minute simmer in the syrup I dried and sugared them just as I did with the peels. The slices are much more worthy of being called a candy than the peels. I love the way they look! 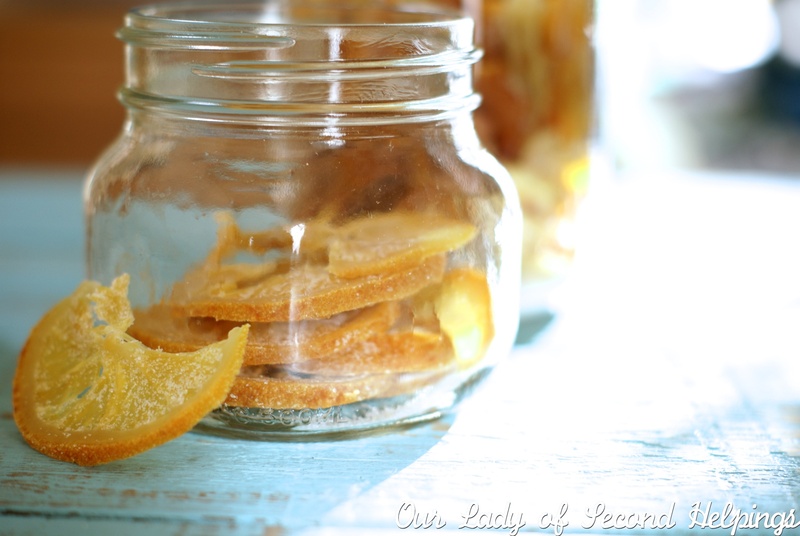 Next year I may zest all the citrus to make candied slices instead of peels. The zest can be frozen and used as needed in recipes. 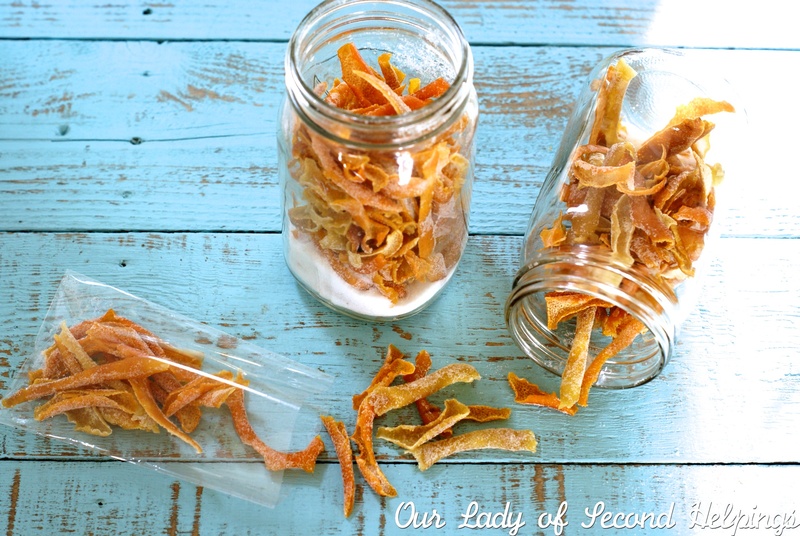 To start this project I followed the instructions for Candied Lemon Peel on allrecipices.com. I recommend reading through the comments before beginning, they held some very helpful tips. The process is simple but it takes a bit of time to remove all the citrus peels. I carved large strips from oranges, lemons, and grapefruit then went back and more carefully ran my paring knife along each strip to remove as much of the white pith as possible. Following the instructions I blanched the peels twice in boiling water before adding sugar to the third batch of fresh water. I used twice the volume of water but the same amount of sugar to create my candying syrup. The large batch of peels simmered for 20 – 25 minutes before I removed them to dry. After the strips of peel came out of the pot I dropped in the orange slices. These needed only about 10 minutes. Arranging everything in a 200 degree oven for 1 hour and then turning off the oven and leaving everything to sit for the remainder of the day proved the best method dry the peels and slices. Once dry I collected the peels into jars with about 1/4 cup of sugar. Several times a day for the next three days I gave the jars a good shake to redistribute the sugar. With the peels and slices fully “cured” I packaged them in cellophane for gifts. I will keep some in a jar to use in baking. Kept airtight the peels have a shelf life of several months. Tip: Keep the syrup simmering in your pot until it has reduced and thickened. Leave as is for a light taste or add spices like cinnamon & cardamom. The syrup can be kept in a jar in the refrigerator for several weeks. Use it to make festive cocktails. It can also be drizzled over yogurt, ice cream, or pancakes! I’ve gotten carried away with all the sweets of the season and have already had a few too many treats, but I’m tucking this recipe away for January when things settle down a little bit. 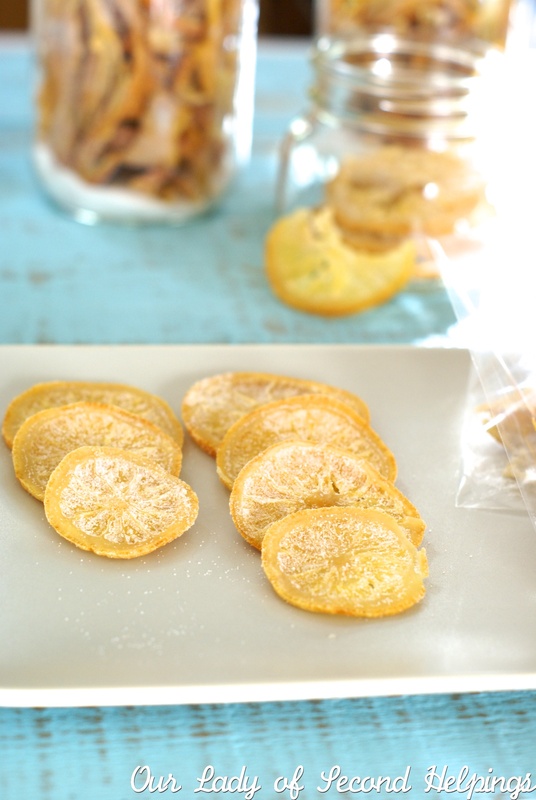 Also, I love your idea of using the candied citrus in baking! 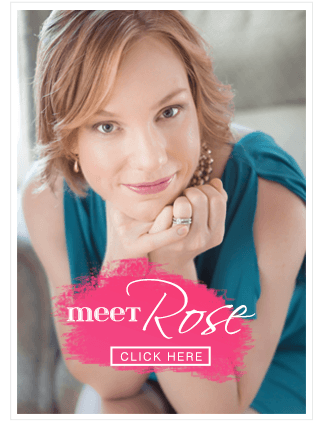 Thanks, Rose!